Ideal replacement for original power supply. Universal compatibility - Comes with 6 smart tips for main base unit and extra handset unit. 2 Year warranty - Power up your device with confidence. 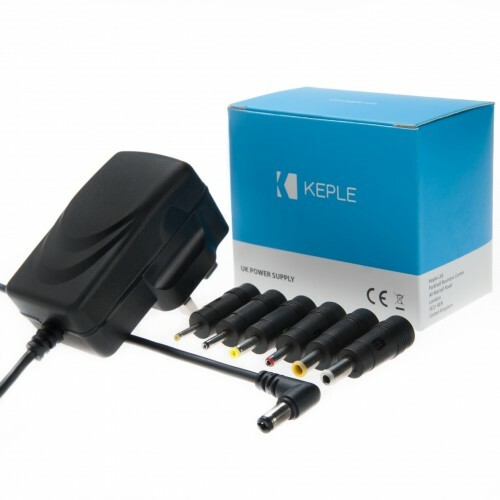 Simply plug the Keple power supply unit into a properly wired AC power outlet and connect your device to the DC plug. Use extra attachments if needed. High efficiency AC/DC Keple universal power supply adapter with DC Plug. Short-circuit and automatic overload protection. This universally applicable Keple Universal DC power supply with DC Plug provides you stabilized direct current (DC) 6v and a maximum current of 2000mA. IDEAL REPLACEMENT - 2m long cable lets you place your devices exactly where they need to be. Power supply for your home or office appliance. RELIABLE & COMPACT - Short-circuit and automatic overload protection. Thermal Protection. IC Controlled Stable Voltage. Less than 0.3W standby consumption. UNIVERSAL COMPATIBILITY - Comes with 6 smart tips for main base unit and extra handset unit. Angled connector is perfect for tight fit and confined space applications. 2 YEAR WARRANTY - Power your device with confidence. PLEASE NOTE - Compatible for use with the models listed in title only. Please do not buy if your model isn't in the title. Input: 100-240V AC, 0.6A Max, 50 / 60Hz. Output DC 6v max 2.0A (2000mA). Plug Type: UK plug (3 pin). Tip size: 5.5mm x 2.1mm. Additionally comes with 6 extra tips 2.5x0.8mm, 3.0x1.1mm, 3.5x1.3mm, 4.0x1.7mm, 5.0x3.0mm, 5.5x2.5mm. if you want to use our power supply with other devices than listed in title, then, make sure that voltage (6v) matches device requirements. The specified maximum current must not be exceeded under any circumstances.